Propagation through soil of train induced vibration. Railways and underground metro systems are an environmentally-friendly solution to society’s increasing requirements for mass transport. However, noise and vibration propagate from such systems are a major issue, mitigation of which can lead to significant costs. Ground-borne vibration generates at the wheel-rail interface, due to wheels and track irregularities, and propagates to nearby buildings causing annoyance to people and malfunctioning of sensitive equipments. Inhabitants of buildings perceive vibration either directly, due to motion of floors and walls, or indirectly as re-radiated noise. Disturbance can also occur due to movement of household objects, especially mirrors or due to rattling of window panes and glassware. The problem can be more serious in some circumstances, such as when an underground railway tunnel passes below sensitive buildings such as concert halls. MOTIV is a collaborative research project between the University of Southampton, Institute of Sound and Vibration Research (ISVR), and the University of Cambridge, Dynamics and Vibration Research Group (DVRG). More information can be found under Research Team. MOTIV is funded by the Engineering and Physical Sciences Research Council (EPSRC) and strongly benefits from a stakeholders group of world class academics and industrial partners. More information can be found under Stakeholders Group. 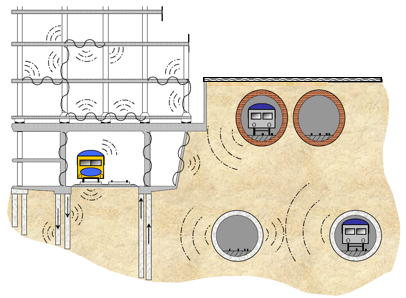 MOTIV attempts to provide a good understanding of the generation and propagation of underground railways vibration and its effects on buildings in close proximity. This will lead to improved models for the prediction of ground-borne vibration and noise from railways in order to reduce prediction uncertainty. MOTIV addresses the non-linear behaviour of track elements and the dynamic tunnel-soil-pile interaction for single as well as twin tunnels. The main hypothesis of the work is that the level of accuracy of predictions will be significantly improved by accounting for these issues when modelling ground-borne vibration from railways. MOTIV conducts a series of comparisons between models developed at ISVR and field measurements, identifying track parameters and vibration due to running trains on tracks with both discretely and continuous supported rails. Another set of field measurements is used to examine the effect of weak coupling on models developed at DVRG.